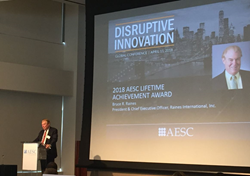 Bruce Raines, President and CEO of Raines International, was honored by the AESC for his lifetime of achievements and contributions to the executive search industry. Raines International Inc., a leading executive search firm, announced that Bruce R. Raines was honored as the recipient of the Association of Executive Search and Leadership Consultants (AESC) 2018 Lifetime Achievement Award. The AESC comprises more than 9000 consultants across more than 350 firms in 70 countries. A pioneer in the executive search industry, Bruce Raines leads the firm across offices in New York City, Bentonville, Boston, and San Francisco. Bruce Raines has continuously led the firm since its founding in 1969. He helped lead the AESC and Cornell University to create an Advanced Certificate Program in Executive Search and Leadership Consulting, which launched in 2012. Bruce was an early and consistent champion of creating educational programs and performance standards for executive search consultants. "Bestowed annually since 1982, this prestigious award honors and recognizes the highest standards of work,” said Dan Smith, Managing Director and COO of Raines International Inc. “It is extremely satisfying to see the AESC celebrate Bruce's contributions to the development, evolution, and credibility of our industry." Founded in 1969, Raines International Inc. is one of the country’s leading retained executive search firms, conducting global searches for “C-Suite” executives and their direct reports. Raines International Inc. offers unparalleled access to exceptional talent across the globe, leveraging over 45 years of experience building exclusive relationships. With expertise in all major industry sectors and functional areas, its client base includes privately-held companies, publicly-held corporations, leading private equity and venture capital firms, and not-for-profits. The firm’s collaborative partnership with its clients, global reach, and industry and functional leadership allow Raines International Inc. to engage the world’s top talent to serve each client’s unique leadership needs. The firm is a longstanding member of the Association of Executive Search Consultants (AESC) as well as the International Association for Corporate and Professional Recruitment (IACPR). For more information about the firm, please visit http://www.rainesinternational.com.